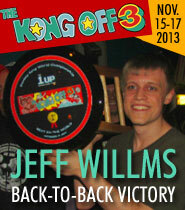 December 18th, 2013 - The grand finale to this year's Kong Off 3 coverage has arrived, and one could argue that the best was saved for last. In "The World's 13th-Best Donkey Kong Player Has Something to Prove", The Verge follows Shaun Boyd and Mike Groesbeck to the Kong Off 3, with a feature comprising an article by editor Jesse Hicks and a 16-minute short film. 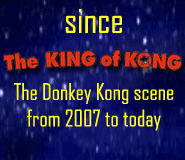 Rather than go in a more straightforward direction, like keeping the attention on the champs (Hank or Jeff), or doing a King of Kong update starring Billy/Steve, or even taking the "contender" angle with Ross or Dean, the Verge crew instead chose to focus on Shaun and Mike, two of the quieter, more low-key members of the Top 12. I think this was an inspired approach. This pensive, atmospheric film, though, is strikingly unique among the rest of the set. It is, first of all, the most "painterly" of any of the preceding Donkumentaries, beautifully shot and tinted. It has a mood and pace that we haven't seen before, moving more slowly, without hitting all the same marks to which we've grown accustomed, and never once getting cheeky or ridiculing about the subject matter. Vice gave us a high-energy rivalry; The Verge a melancholy rumination. What a great combo! Bravo, gentlemen. It took creativity, and balls, to come at the material like this. And congratulations to Shaun and Mike for the spotlight. Bottom line, both of you took, and held onto, a place in the main lineup. If the past year of fierce competition showed us anything, it's that this is no easy task. No further "proof" necessary. 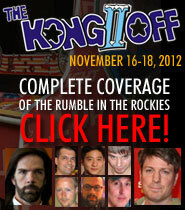 Note: Boyd's ranking on the official Twin Galaxies scoreboard is 12th. 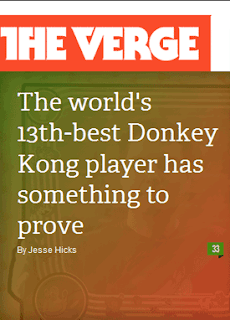 The Verge identifies him as holding 13th, which refers to his place on the community-run Donkey Kong Forum High Score List. The forum list is "unofficial", but is actually more tecnically accurate, since it includes games not submitted to TG. Freaking sweet film. 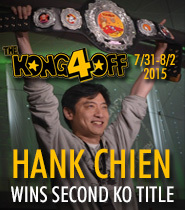 Billy MItchell is jealous.